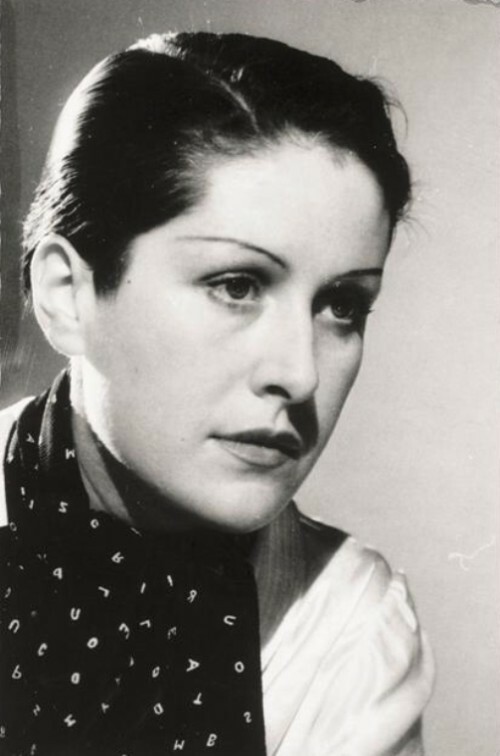 The fifth muse of Picasso was Dora Maar. She was a different type of woman: smart, thin, nervous, unbalanced. 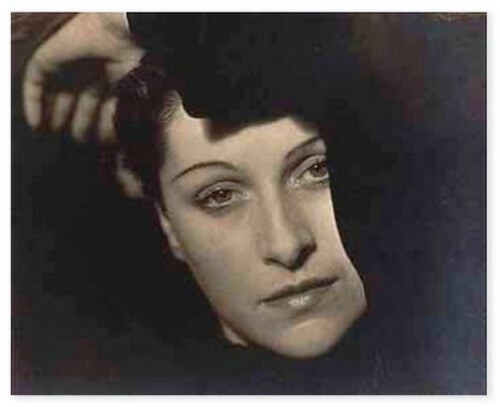 Dora Maar came into the artist’s work as a crying woman. 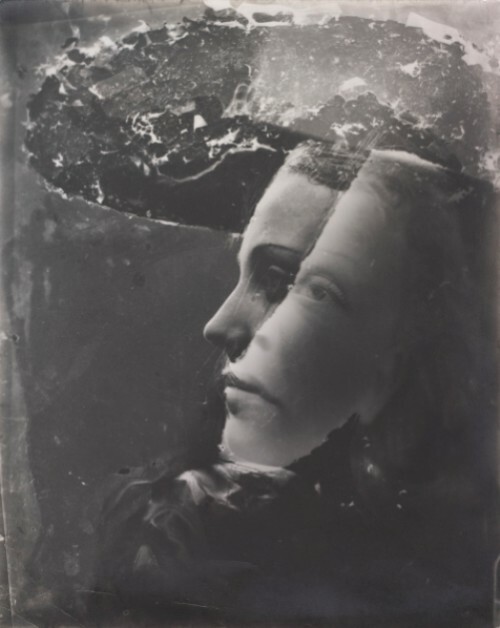 She was known in the bohemian circles as a French surrealist photographer, poet and artist who worked in advertising. 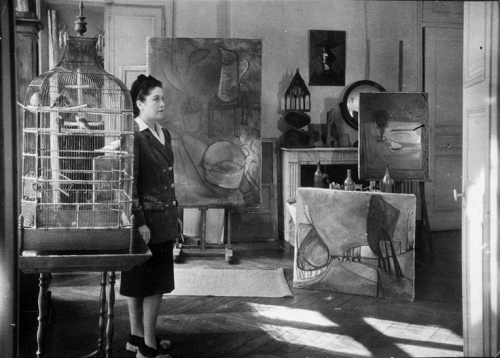 Dora Maar and Pablo Picasso had been in relationships for nearly 10 years. 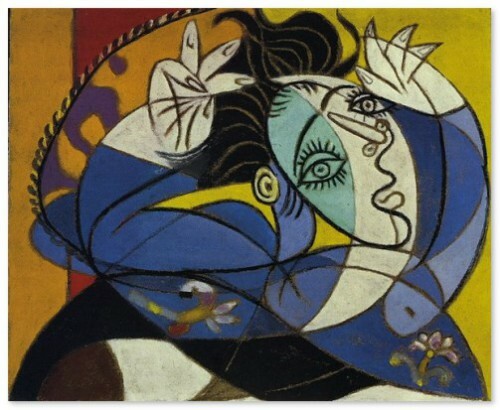 Pablo Picasso became acquainted with Dora in 1936, when he finally broke with Marie-Therese. Picasso said that once the two lovers met in the studio and asked him to choose one of them. He replied that they should fight for him. This scene was one of the strongest, most memorable to him for life. Dora was talking to an artist in the cafe where Picasso came with his dog. The dog began to beg from other tables. The artist called him in Spanish, and Dora, who knew Spanish from childhood responded to him. When they met, she was playing with a knife, inserting it between her fingers. One time she missed and injured finger. Maybe that’s why she can be recognized on the portraits by bright red sharp nails. Her bloodied gloves, in which Dora was that evening, the artist kept in a special display case. She was 28 years old and he 54. 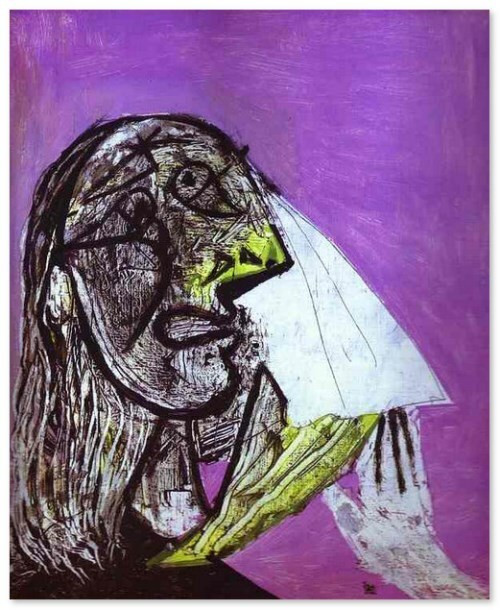 Portrait of Dora “Weeping Woman” became a symbol of grief, pain and suffering. Everything in the painting is subordinated to this idea. Pablo always portrayed Dora with huge eyes, sad, pensive or weeping. He emphasized her delicate nervous system, clean face and long red nails. 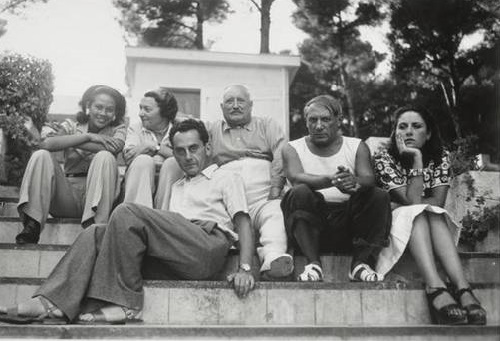 Dora, as the photographer made ​​a lot of pictures of Picasso. They were united not only with passion, but also with an intellectual conversation. 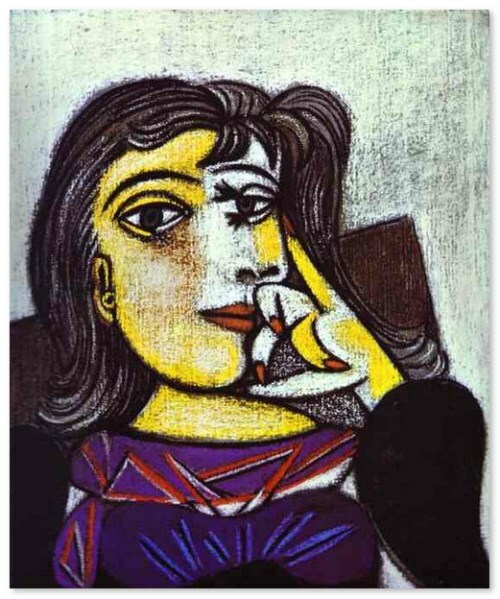 Living with Dora, Picasso began experimenting with engraving, photography and painting, linking them together. German bombing Guernica in 1937 during the Spanish Civil War was the first mass military murder. 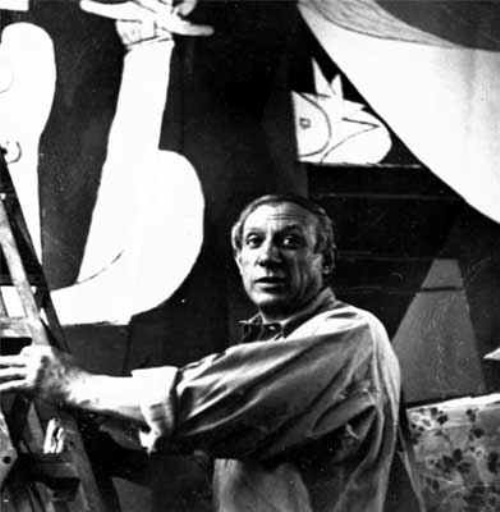 Picasso began working on the idea of painting. Dora as a photographer, captured all stages of the “Guernica”, leaving the chronology of the creation of a masterpiece. The painting, executed in black and white and gray tones, occupies a huge space in the museum. The picture is impressive in size, fear and terror emanating from it, even if you do not understand until the end the meaning of the image. It is said that the image of a crying Dora has played a significant role in the picture. In the spring of 1945 nervous attacks repeated more and more often. 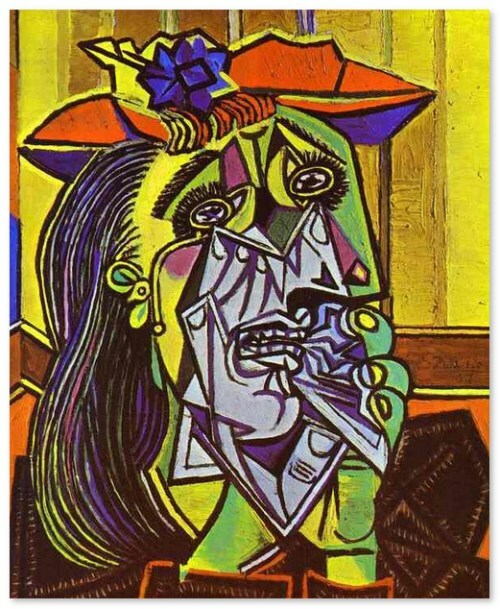 Fearing that Dora could commit suicide, Picasso places her for treatment in a psychiatric hospital to Jacques Lacan, who treated her with psychoanalysis and electric shocks. After leaving the hospital, Dora didn’t return to Picasso. 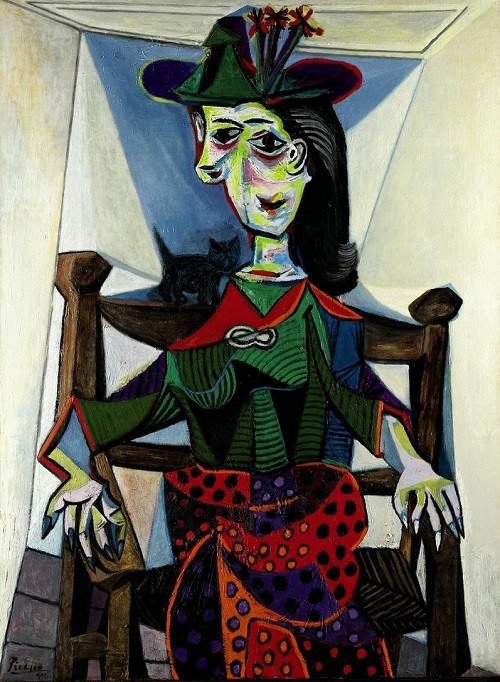 American art historian and literary critic Mary Ann Caws quoted Maar as saying, “After Picasso, God.” Although she had male friends in her life, no one replaced Picasso for her. Dora spent her last years living in the house Picasso had given her. Relationships of Dora and Picasso became a legend. On the set of their love books are written and films are made.